You are currently browsing the The Accidental Hawaiian Crooner blog archives for February, 2012. I love the this album. I love listening to Aunty Edith’s voice. I love how she speaks an introduction (in Hawaiian!!) for each of the songs. I love that the recording has the “down home” kind of feeling. Authentic to ‘da max. 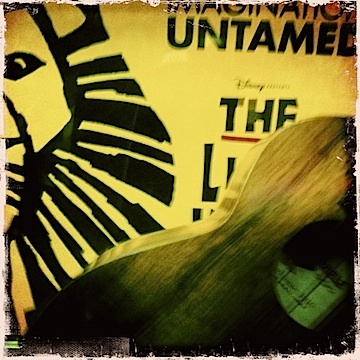 Like you’re sitting right there in someone’s living room or backyard and basking the amazing music and spirit of Aloha. Written by Aunty Edith, the song is a beautiful tribute to the plumeria flower. I love that she says pua melie. I have only ever heard it called pua melia. Love the differences!! Celebrate each island (and sometimes each island’s individual districts) and the linguistic diversity! *Please click HERE to visit the Edith Kanakaʻole Foundation’s website. Does it get much better than Nathan Aweau interpreting a hula classic? Um… nope. Pretty awesome, if you ask me! And I love this song. It’s a favorite! And listening to his voice (so smooth!) glide effortlessly is just so very inspiring and soothing to the soul. Yes. *Please click HERE to visit Nathanʻs website. I was reminded of this song by my friend, Kumu June Kaililani Tanoue, this week. It had been a while since I’d listened to it. So when she mentioned it in an email, I immediately went to my music library to look it up and listen to it, again. I woke up this morning with this thought: I NEED TO LISTEN TO SOME OLOMANA TODAY. And I reached for this classic album. With my iPod on shuffle mode, this was the first song that played. It started me daydreaming about Diamond Head and being back on Oʻahu. 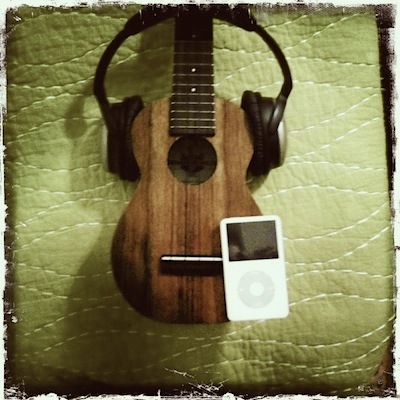 I’m only a simple strummer with the ʻukulele. Byron Yasui is a master in the truest sense. When I listen to what he can do with the ʻukulele, I think my mouth is open in amazement the whole time! Love this song and his fantastic recording. I found it to be so inspiring this week. Finding the Voice: Part 5 – Talkin’-story on Molokai! In November of 2011, my friend Lisa asked me to come to O’ahu in January to be a part of the Japanese Cultural Center of Hawaiʻi‘s New Year’s ʻOhana Festival. She knew my story and wanted me to come share and sing as part of the festivities. I arranged a trip so that I could be on Oʻahu for the festival and then planned to head to Molokai to spend some time with Pops and the ohana. Once those plans were in place, all sorts of additional opportunities presented themselves–including opportunities to do some press for the festival as well as a chance to sing on Pakele Live! Immediately after the Japanese Cultural Center of Hawaiʻi’s New Year’s ʻOhana Festival, I boarded a plane bound for Molokoai. The short flight proved to be uneventful and I was greeted by Mom and Pops at the airport. As soon as I’d loaded my bags and my ʻukulele into the truck, we headed to the Valley. Pops was aware that I had been singing for the past few days on swollen vocal cords. We didn’t do too much talking that evening. We all hung out and just enjoyed being in each other’s company. And then it was time to head out of the Valley and into town. My period vocal rest had come to end. 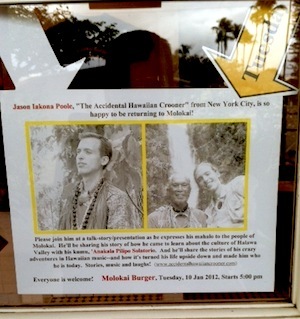 Pops had asked me to do a talk-story/presentation while I was on Molokai. What’s a talk-story? Well… In Hawaiʻi, that’s what it’s called when folks get together and “shoot the breeze”–they talk-story. But Pops was really asking me to share my story. Maybe talk about the things that had lead me to Molokai in the first place. Maybe share some of the things I was learning from my times down in Hālawa Valley. Maybe share about the things that I was doing back in NYC like working with the kids in the public schools, sharing Hawaiian culture and teaching ʻukulele basics. And, most importantly, I would have the opportunity to express my deep love and appreciation for the island of Molokai and her people. The crazy thing is that I didn’t know what to expect. I didn’t know WHO to expect at the gathering. Would it be a group of locals/elders who’d come to hear what this haole guy from New York City had to say? Would it be malihini (outsiders/tourists) on the island that wanted to know more about the island’s culture? Or (gulp!) what if NO ONE showed up? Ha! Easier said than done. I tried to explain that I still have a lot of “baggage” left over from my theater days. It would be like putting on a show and having an empty audience. And I knew that it would also serve as a way for him to watch me in action. To see me as a teacher. To see WHAT I presented. To watch HOW I presented it. To see what I truly understood. And to see where big gaps lay in my knowledge and understanding. Nothing like speaking/presenting in front of your teacher, right? Just a little bit of stress. And add that to the laryngitis, and you’ve got a scary evening! Ha! 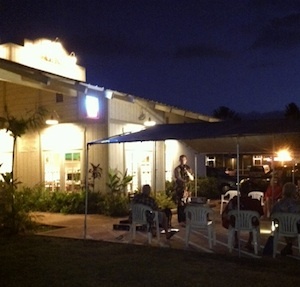 The talk-story was being done at Molokai Burger–one of my favorite places on the island. They’d so generously donated the space for the event. And they even set up a tent with chairs outside! I felt like a rock star, for sure! The evening unfolded in an effortless way. Pops opened the talk-story with an oli, a chant. In Hawaiian, in the same tradition his ancestors done for centuries, he welcomed the guests and introduced himself and gave his genealogy. I took a deep and calming breath. It was going to be OK. By the time he’d finished and was speaking English, again, I was ready to show up and say, “Yes!” to this opportunity. The folks that attended were a great mix of local residents as well as tourists who were visiting the island. One topic seemed to lead naturally to another. We laughed. We shared music. I was able to talk about how much the island of Molokai means to me. How wonderful it is to feel so at home on an island 5,000 miles away from the home I have in NYC. How wonderful it feels to be accepted and loved like a son by a family that does not share my DNA. AND… I was able to listen to those that came. Listen to the stories that the local residents felt inspired to share. Listen to the stories of how the island had changed the lives of the visitors that were there. It was an opportunity to share. And looking over at Pops’ face, smiling and laughing, let me know that I was doing OK. That I hadn’t put my foot in my mouth too badly. That I may still have a long way to go–but I’m on the right path. And my voice lasted through the whole evening. Bu would it last through one more BIG SHOW commitment when I headed back to Oʻahu for Pakele Live? The song UʻILANI is a Hawaiian classic and much beloved by falsetto singers. Who composed this gem? You guys rock. True story. And this week’s winner, chosen randomly from all of the correct answers, is… (Drum roll, please…) DERREK RUBINA! Congrats, Derrek! You are a Trivia Superstar! A giant MAHALO to everyone for playing along this week. I hope you’ll play along next week, too!